"This is the diary of a young girl who has to live on their own for the first time in their life. Join her as she makes makes friends and learns about the world she lives in." 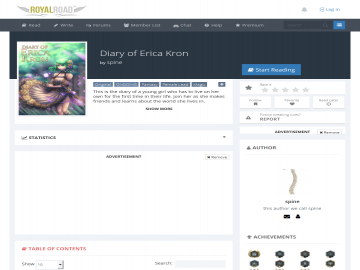 Diary Of Erica Kron by Spine is a fantasy novel updated daily. Diary Of Erica Kron has not been tagged yet. Help others find Diary Of Erica Kron by tagging it! Diary Of Erica Kron has not been reviewed yet. Diary Of Erica Kron has not been recommended yet.